Danish ICO Blockshipping is targeting the global container industry through its Global Shared Container Platform (GSCP) – aiming to revolutionise the container shipping, by making key processes more efficient. The GSCP platform will be a blockchain-enabled container asset registry, which lists the full global inventory of containers with times and locations. It aims to provide an annual cost saving for the global container carriers of USD 5.7billion, in addition to reducing global CO2 emissions by 4.6m tons each year. This is the first Nordic shipping-related ICO, and it plans to achieve 60% market coverage in the next three to four years. Why are they issuing two tokens? Blockshipping will be issuing two tokens – the internal utility Container Platform Token (CPT) and the external dividend Container Crypto Coin (CCC). CEO & Founder Peter Ludvigsen says: “The idea of issuing two tokens came from watching what happens when utility tokens become popular on the secondary market and how that tends to invalidate their viability as utility tokens for their originally intended purposes. “Transaction prices on the Ethereum platform have gone up significantly as a logical consequence of the rise of the value of Ether. Why is it important to keep the internal CPT and the external CCC separate? 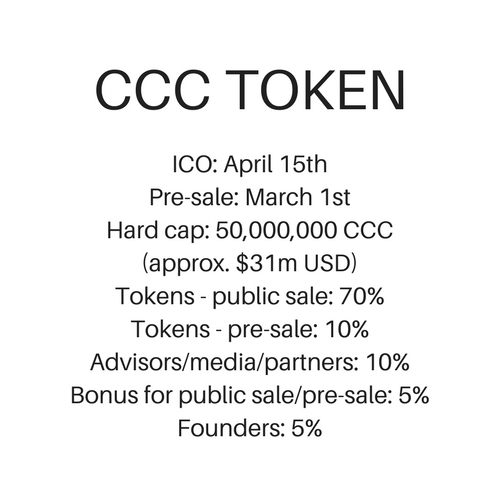 Ludvigsen says: “The internal and external tokens will be separated, but in an asymmetrical uni-directional way so that the external public traded token CCC cannot affect the stability and price of the internal token CPT, but the internal token can and should support the value of the external token by sharing revenue generated by the transaction volume in the internal system on the GSCP platform with the external token owners. The key team consists of the trio Peter Ludvigsen, CEO and Founder, Christian Gyntelberg, COO and Jesper Vedelsby, CTO. These three all boast a long history in the ocean shipping and ports industry, with previous employers including Maersk Line, UASC, INTTRA, A.P. Møller and DHL, to name a few. Additionally, it is worth noting that the ICO is the first ever ICO to be based on the so-called ICO 2.0 framework, which is a result of a group of Danish ICO experts launching a framework to protect the idea of the ICO and to facilitate its development. Ludvigsen says: “The total addressable market is the global fleet of containers which is approximately 27.7m container units. Each container makes on average 5.5 revenue-generating trips annually which means that the annual combined trips of containers are 152.4m trips. “The Blockshipping GSCP target is to reach a market share of 16m container units equal to approx. 88m trip. “The reason for the use of blockchain technology is that it enables global container carriers who are fierce competitors to use a system where the trust is built into the system. “Carriers and other stakeholders can start to share containers through GSCP a neutral third-party platform that safeguards data and transactions using blockchain technology. “This creates the lacking ingredient of trust between parties that has been missing in earlier attempts to implement container sharing in high scale volume,” says Ludvigsen. Based on our ICO Ratings, we rate Blockshipping as a Solid ICO. The team has longstanding experience in the industry, from some of the major players in the ocean shipping and ports industry. Additionally, they are the first ICO to be based on the ICO 2.0 framework, meaning it’s an ICO worth following. To join their whitelists, click here.